I was going to say maybe a map update should only show on the front page if the upload changes, but what would that do for externally hosted maps, and sorting in the map vault? Where does the "update" line get drawn, and how can it always be enforced? Perhaps a checkbox when editing that says, "this map has moderate to substantial gameplay/visual changes" that would put it in a cue for a mod to check (temporarily preserving the old file until the mod checks them). It would then be the mods decision if it indeed has great enough changes to show up in the vault panel on the front page again. But that could get out of hand if too many people abuse it and check the box every time they make a tiny fix. On an unrelated note, does anyone else have problems getting to the site if they just type in twhl.info? I HAVE to type out http:// or https:// otherwise I just get the ISP search page saying the site couldn't be found (in my case, Verizon Fios). Also using Firefox, if that makes a difference. It's not like it's a big deal. You update your map? Welcome to the front page. Yeah there will be few times when somebody updates all their maps, but what's wrong with that? I just didn't like the idea that I pushed other people's maps off the front page just because I updated the license on all of them. I felt bad about knocking maps off the front with maps that already got their turn on the front. You could also end up with one (or more) maps loitering on the front page with regular updates. Potentially abuseable, too. I dunno, I do see new maps potentially being submerged under old ones being a possible issue. Maybe have two parallel sections, one for new and one for updated? Like anything on TWHL, if it gets abused I'll just ban the offender. I don't see it being a problem, you might be overestimating the number of maps that get uploaded here. You could also end up with one (or more) maps loitering on the front page with regular updates. To be fair, wouldn't this be one of the main purposes of the front page updates? Otherwise people would have to upload separate versions of maps in response to [constructive] criticism. I have noticed a few bugs and problems. A user can display their birthday on their profile, however the field defaults to 01/01 instead of being blank. I don't know if it's because of the screen resolution or the browser but I can give info if needed. 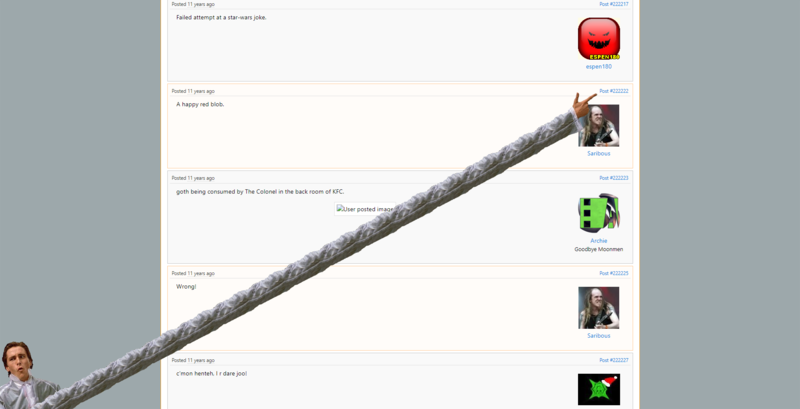 The list of threads in the forums seems to be pretty widely spaced. In general discussion, I have to scroll to get past the stickied threads to view the recently active ones. Perhaps give the user an option to minimise threads they don't want to see, or something similar. I can't replicate your laptop issue on any screen size, is your browser up-to-date? The website URL has to start with a protocol (e.g. http://). I have un-stickied a bunch of old threads in general discussion. In most sites that have a forum preview on the front page, there would be a link that takes you directly to the most recent post in the thread. I can't find that here. When I click on the "replies", it just takes me to the original post in the thread, but I'd rather jump to the latest post. On the main page I'd probably have map vault after the forum too. Had some ideas on layout changes I might pass through later on if I get a chance. Yep, well these are just suggestions you could experiment with to see how can you hone the visual side of it. The blue is still a good colour, but I find trying to contrast blue and orange a little tricky in a pallete. You could try a different shade of blue, such as the "update preview" button colour maybe... But saying that, the blue does work pretty good on the smaller text links I think. Whatever the color scheme, it needs to be consistent, and reflect functionality. 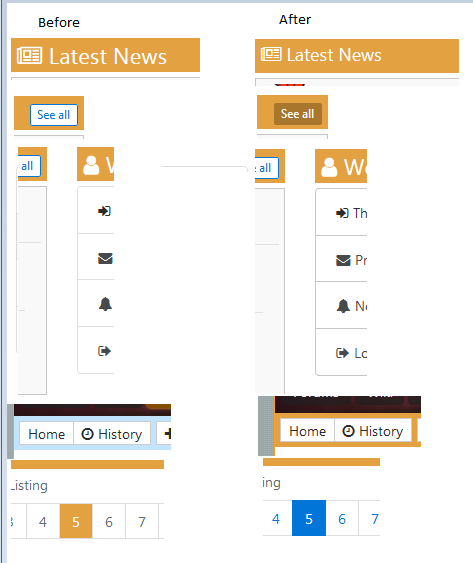 Blue should always indicate links, and orange should be non-functional screen elements. I forgot to reply, I have just checked and no it is not up to date. Holy vulnerability, you need to update that! Browsing with an unpatched 4-year-old browser is just asking to be infected by malware. It is possible to update the server config to listen on www.twhl.info as well as twhl.info? A few times I've just typed twhl.info into the Chrome address bar and have been redirected to www.twhl.info which doesn't resolve. Seems like a Chrome problem to be honest, but I've added a DNS record for www which should hopefully fix it. No, having the same problem in Firefox too. I had mentioned it earlier in another post but the main subject was about the vault submissions on the main page so it was overshadowed. Well, it should be fixed, I just tested using www and it redirected correctly. Works for me now - many thanks. I agree it's a browser issue (if it looks like a URL as opposed to something to pass to a search engine and it prepends a protocol and www. - I could always type the www. but I think typing just twhl.info is easier). I don’t know if it’s practical (or aesthetically feasible) to implement, but what say you, Pebs, to differently styled links for pages in the wiki that don’t exist yet (like Wikipedia does), and/or pages that are still Review Required? Hello, I have a journal notification but there's no link to the content, and I'm not sure what this means. I checked my last journal entry and there's no new entry there. Darn, I thought I fixed that yesterday, it's because it's an older journal without a title. I'll take another look later. A button to quickly un/subscribe to all pages within a category in the wiki would be nice. Also perhaps, on a subcategory page, have a list of the composing categories. I don't actually remember why I thought this would be a good idea... but oh well! Sorry, I meant, like, links to those category pages. As it stands, you either have to go through the list of categories or alter the url manually. Subcategory page could also perhaps show the information from the lowest category page. Like, "Entity Guides > Half-Life Entity Guide" could show the content of the "Half-Life Entity Guide" page (provided the page makes it clear that the pages being shown beneath are filtered to more than one category). I dunno, just some thoughts. I'm not sure how it'd look in practise. Thanks for the bug report, it's fixed now. 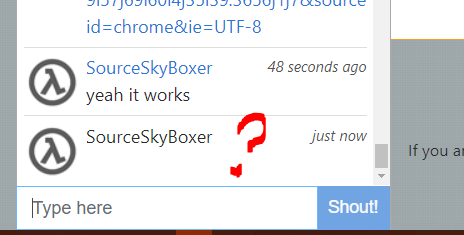 If I add link to wikipedia than your chat box hides me. Why does it not work yet? Thanks @Pengiunboy I resolve that Ctrl+F5 from Chrome lol. Now It works.. Thanks! Search doesn't search in journals? I'm just going to keep putting random site ideas here. What about a way to tag people in forum posts and journals, Twitter-style? Maybe create a one-off notification on the thread when someone tags you. Format could be simply "@Jessie", or perhaps some other format more in line with the rest of the WikiCode, like "[user:3643]". Not sure how easy it would be to prevent re-notifications via editing and other quirks. 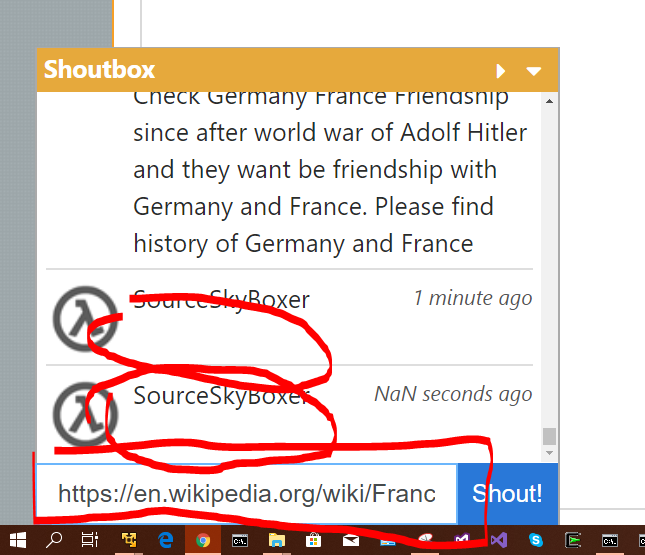 How about having the text entry box in the shoutbox expand when you're typing a longer shout into it (text-message-style)? I don't know how easy that is to implement on a webpage. But left- or right-arrowing through the message is not always practical, especially on mobile. Thanks for all your hard work fixing the bugs and updating the site. Clearly it's a labor of love. Hello everyone, do we want to have code block in TWHL.info? If we use C++, C#, XML, cfg and gam script formations? And can shoutbox with editable mode if you type wrong character Example: Lenguinboy and you will replace with L to P than I don't need write next shoutbox message. Does it work possible? If no, than it is okay.. There's a link "Formatting help" above the text area that links to a page that shows what kind of formatting you can use. That includes code blocks. Ah SoloKiller! I will click formating help and i add features. Thanks! I'd offer to help with this beyond just this example code if you're interested in implementing this, but, you know, I'm lazy. What if maps had some kind of edit history like wiki pages do? Not so much for actually retrieving older versions, but just as a place to note when edits were made and what they consisted of. I guess I actually mean an update log. P'raps with the most recent update visible on the map's page. It just seems a little clumsy to incorporate edit information into the map's description, if it's done at all. People can make an edit worthy of being bumped right into the main page of the site without any indication of what that edit was. I don't really know a good solution to that. The strikethrough formatting button doesn't put the correct marks in. It places dashes, not tildes. I've got to say there's a potential issue with this page in that it doesn't say which game/engine each map is for. There's a rule in the competition that says you need a readme file that clearly states what game it's for... but it might be a good idea to add a game selector when you post a competition entry too so it's easier to spot. but it might be a good idea to add a game selector when you post a competition entry too so it's easier to spot. I strongly second that, I had to guess which game one of the entries was for. Processed in a seductively tiny 430 milliseconds.